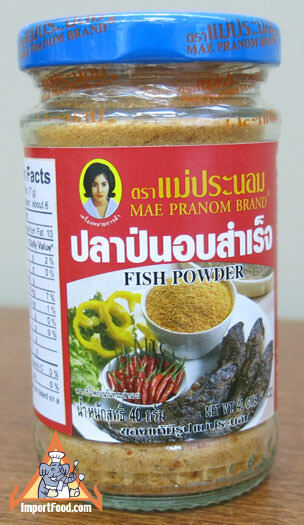 Brand New Stock -- This is the BEST Fish Powder ever, from Mae Pranom. Fish powder with chili is a unique product with a wide range of uses, and it's a personal favorite in our home as a "Secret Weapon" in spicy Thai dipping sauce. The dipping sauce, recipe below, is delicious with vegetables or alone simply sprinkled over steamed jasmine rice. When sprinkled over rice, it's not only fantastic but also addictive--you might have thought you had to fly to Thailand to find this truly authentic aroma & flavor. It's also good sprinkled over a salad, or added to Laotian-style soups Goes well with namya curry or added to Thai vegetable soup (kaeng liang). Ingredients: smoked fish 90%, chili 10%. Product of Thailand.